First, this exhibit at the Monterey Bay Aquarium is itself beautiful. It's quite large - 28 feet high - and with some of the world's largest windows. But that's not what makes it beautiful. The brilliant sunshine penetrating down through all that sea water and illuminating the dark interior of the hall. The photographer did a wonderful job capturing that light. I also like this photo because it so nicely conveys the wonder of those children's discovery of the natural world. Seeing something for the first time - it doesn't happen as much as we get older, but that's one of the great things about travel. And if we let go of some of the "tarnish" that tends to harden and jade us, we too can experience some of what has so fascinated those children here. This photo is great also because in all the times I've been to the Aquarium, I don't ever recall so few people being in front of this exhibit. But the truth is that when you're standing there looking at the great swaying frond of kelp and watching the marvelous variety of fish and sea creatures going about their business, you feel exactly as if you were the only one there. It takes you out of yourself and you are consumed by the excitement of feeling as if you are down in the ocean instead of being on land. Finally, I like this photo because it captures so wonderfully well what the Monterey Bay Aquarium represents as an institution - "to inspire conservation of the oceans". 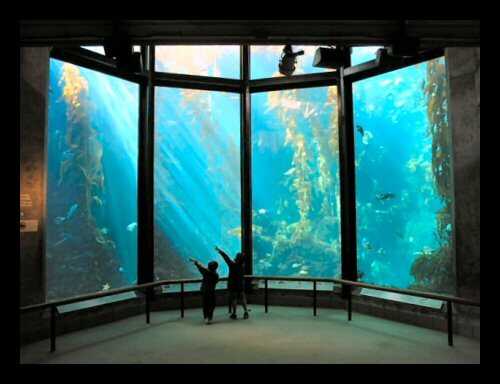 The Monterey Bay Aquarium is one of the finest attractions anywhere and well worth a visit. Click on this link for an account from one of our readers about their visit to the aquarium. Monterey Bay Aquarium discounts are available to active and retired military. Additionally, there are a number of companies that offer Monterey Bay Aquarium discount tickets to their employees. Information on both programs is available at this page of the Monterey Bay Aquarium site. There are a number of hotels, B&B's, motels, inns and RV parks that offer a package deal with discounted aquarium tickets. Information is found on this page.